When I was little, I left out cookies, a diet orange soda, and some lettuce for Santa and his reindeer, similar to most children. Additionally, I drew out a map of our house in case he got lost (I don’t think it’s possible to ever get lost in my house, but I wanted to make his delivery of presents as easy as possible). One year, the Christmas tree was moved to a different room of the house, so I gave him written instructions on how to get to the new location. I also told him to not worry about going down the chimney, but instead to just go through the back door. If he went through the door instead of the chimney, he would hypothetically shave off three minutes. Three minutes that could be spent eating more cookies, which is always a good thing. 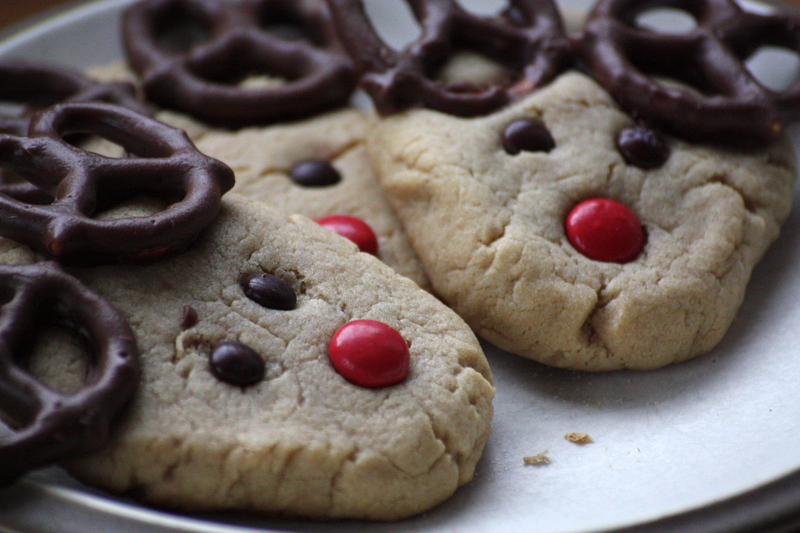 I found this recipe for Reindeer Peanut Butter cookies and I instantly wanted to make them. 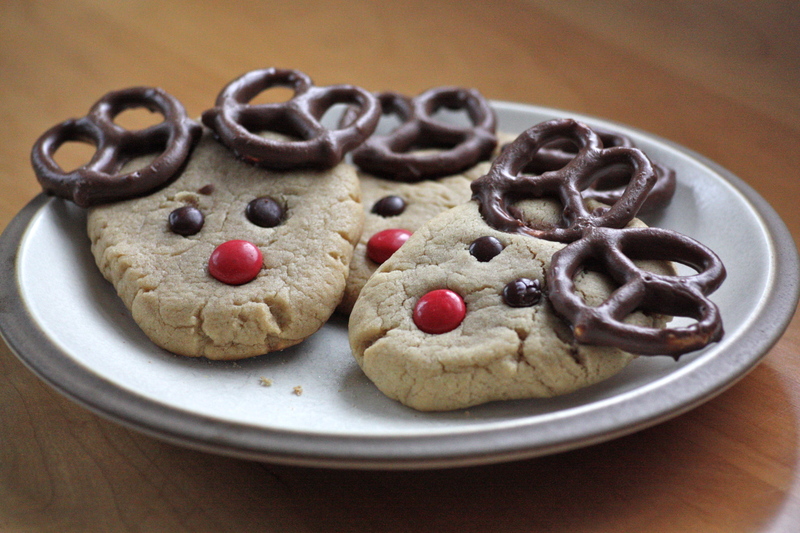 These cookies are almost too good to eat, but then you remember there are chocolate covered pretzels as antlers, and suddenly the cookies are devoured. If I were to make these again, I would add more peanut butter or perhaps use a different peanut butter cookie dough. These were good, but not the best cookie base because of a mild peanut butter flavor. The recipe called for mini chocolate covered pretzels, which I could not find, so I made the cookies larger and used normal sized chocolate covered pretzels. Some reindeer lacked antlers because the bag of pretzels had many broken pieces. Just be wary of this when purchasing the antlers. Preheat oven to 375 degrees. Combine brown sugar, peanut butter, shortening, milk, and vanilla in a large bowl. Beat at medium speed. Add egg and beat until just blended. In another bowl, combine flour, soda and salt. Add to creamed mix at low speed. Form 2″ ball of dough and place on greased cookie sheets. Pinch the bottom slightly to make a point. Flatten by hand. Cook for 7 to 8 minutes until just turning brown. 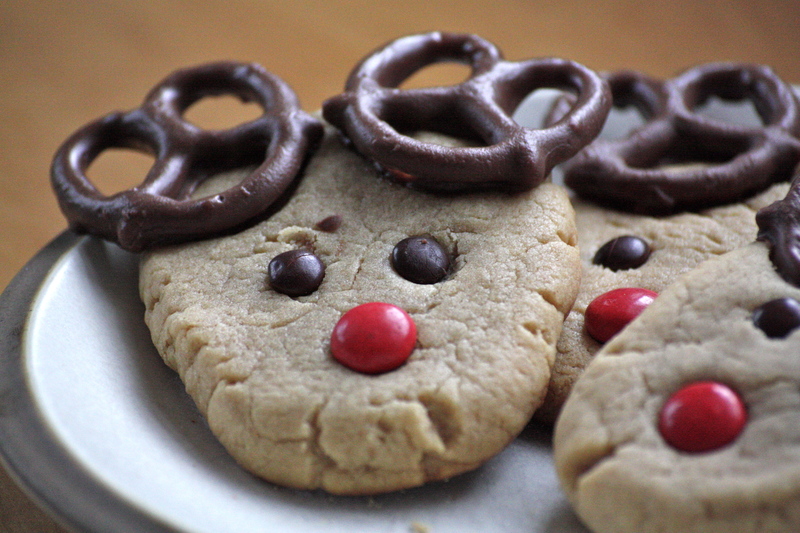 Remove and immediately press 2 pretzel antlers at the tops of the cookies. Press 2 mini M&Ms for the eyes, and one red M&M for the nose. Allow to cool before transferring off of sheet, as the pretzels need to set. Adorable cookies!! They look delicious and doable! Do drop by my space when you can. I’d love to hear from you. The salt of the pretzels, with the sweet of the cookies. Oh my. Get ready for a post about salted caramel pecan cups–they blew my mind! We have an awesome local ice cream place in Louisville called Sweet Cow that has the most original favors. Les’ favorite is salted caramel.